Two weeks ago, as Congress prepared for a government shutdown fight, House Republicans changed parliamentary rules so as to prevent any member of the House from being able to bring up for a vote the Senate version of a government funding bill. House Republicans acknowledge that under a rarely used rule, if the Senate rejects a motion to go to conference to work out differences between the House and Senate on legislation – as Senate Democrats did - any House Member may be able move to concur with the Senate amendment, meaning they could bring the Senate legislation to the floor of the House for a vote. Before the government shutdown, Republicans changed the rule to give that authority to House Majority Leader Eric Cantor, R-Virginia, or his designee for this legislation. 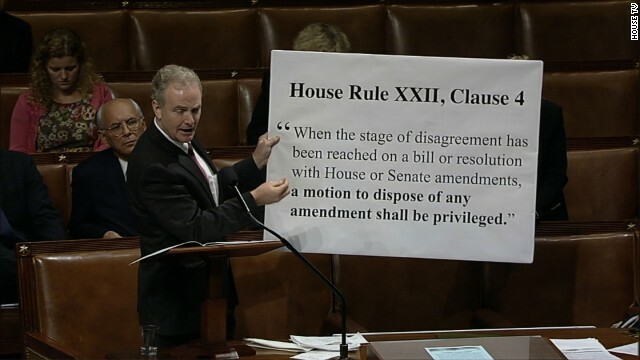 The move was little noticed until over the weekend, when Rep. Chris van Hollen, D-Maryland, the ranking Democrat on the House Budget Committee, raised an objection to the rule change on the floor of the House in a Youtube video that has gone somewhat viral, since accruing more than 600,000 hits. You can watch that video here. House Republicans see the issue differently, saying that their rule change simply ensures that what they see as the Senate’s refusal to negotiate is not rewarded with control of the House floor. Republicans argue that the rule allowing members of the House to bring up Senate bills in such a situation was traditionally used by committee chairmen to quickly dispose of amendments in disagreement between the House and Senate back when that was a commonly used procedure, before 1996. They say they’re unaware of another instance where this practice - which wasn't codified as a rule until 1999, they argue - was used by another member other than a committee chair. House Republicans argue that they have plenty of examples of the Democrats implementing even more stringent rules changes when Pelosi controlled the House, complaints that can be seen in this memo. The rule changes tend to be complicated and confusing – “That section 151(e)(1) and section 151(f)(1) of the Trade Act of 1974 shall not apply in the case of the bill (H.R. 5724) to implement the United States-Colombia Trade Promotion Agreement,” for example, was a Democrat-pushed rule change that took the US-Colombia Trade Promotion agreement off the "fast track" procedures, meaning that Congress would be able to amend or veto whatever the president negotiated.